Sorry for the delay of this post, but I am suffering from a partly dislocated shoulder which means that I have to avoid heavy-lifting and writing for prolonged periods of time, both of which are really difficult to stay away from. Anyway, this is just a reminder to let you know that the book we are currently reading is Harlot’s Sauce: A Memoir of Food, Family, Love, Loss, and Greece, by Patricia Volonakis Davis. Harlot’s Sauce is the story of Patricia herself who falls in love with Greek Gregori, follows him to Greece and tries to make her marriage work. In the meantime however she gives us vivid descriptions of Greek life, culture food and more. Patricia V. Davis (http://www.patriciavdavis.com/), is also the founder and editor-in-chief of the non-partisan Harlot’s Sauce Radio e-magazine and podcast, as well as the president of Harper’s Davis Publishing. And Here They Are… The Next Three Cook the Books Selections! 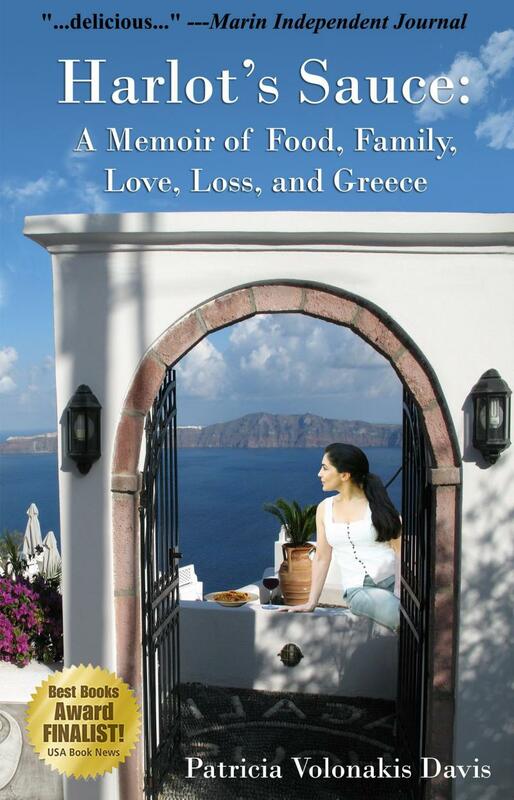 Before we officially set off to Greece with Johanna and Harlot’s Sauce: A Memoir of Food, Family, Love, Loss, and Greece, by Patricia Volonakis Davis, it is time to announce our reading list for the next six months. We have three very different books to read, share, and inspire us to cook delightful dishes. 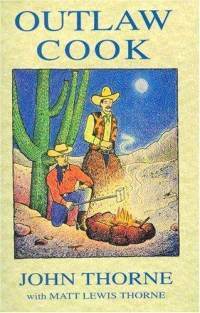 The deadline for your entry for Outlaw Cook is Monday, January 23. At Kahakai Kitchen, I wanted us to get in touch with our inner children, so I selected the classic Charlie and the Chocolate Factory by Roald Dahl. Originally published in 1964, (According to Wikipedia) “The story was originally inspired by Roald Dahl’s experience of chocolate companies during his schooldays. Cadbury would often send test packages to the schoolchildren in exchange for their opinions on the new products. At that time (around the 1920s), Cadbury and Rowntree’s were England’s two largest chocolate makers and they each often tried to steal trade secrets by sending spies, posing as employees, into the other’s factory. Because of this, both companies became highly protective of their chocolate making processes. It was a combination of this secrecy and the elaborate, often gigantic, machines in the factory that inspired Dahl to write the story” The book was a favorite of my childhood and both movies (The Gene Wilder and the Johnny Depp version) are in my DVD collection and I wanted to revisit the book with my CTB friends. Consider this your golden ticket to come up with the most scrumdiddlyumptious dish you can imagine. The deadline for your entry for Charlie and the Chocolate Factory is Monday, March 26. 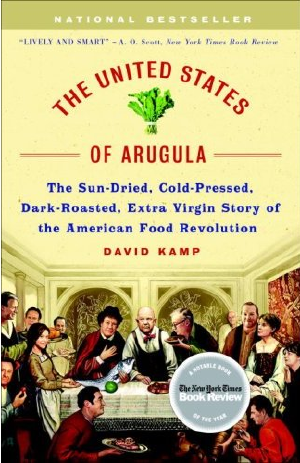 Jo from Food Junkie Not Junk Food will wind up our spring with her foodie history pick of United States of Arugula: The Sun Dried, Cold Pressed, Dark Roasted, Extra Virgin Story of the American Food Revolution by David Kamp. From the author’s site: United States of Arugula is a book about one of the happiest developments of our time: the quantum leap forward in food choice, food quality, and culinary sophistication in America in the last sixty years or so. The book examines not only the social forces that effected this transformation, but the visionaries who changed American food for the better: among them James Beard, Julia Child, Craig Claiborne, and Alice Waters.” We should all find plenty of inspiration to cook from this fun look at the world of food. So beg, buy or borrow these picks and kick of 2012 with some terrific new books. Yes CTBers, we have a winner! But first, a very big THANK YOU to Molly Wizenberg, our wonderful author and judge, for taking the time out of a busy writing schedule to select the winner for this round. I think we will all be putting her new book on our “must-have” lists when it comes out. “Well, I have to confess that I was nervous enough about judging these entries that I had to go make myself a mint julep before I could begin. Why, why, WHY did I say yes to this?! How do I pick a winner?! This mint julep is saving my life. In any case, before I say anything else, I want to thank everyone for being so incredibly kind. Writing a book is such a strange, lonely process, and it can make a person feel so vulnerable… so it was a relief and a pleasure to see it received well by all of you in Cook the Books! Thank you for that. And now to the pesky judging. My criteria were very simple and mostly instinctive: did the post grab me and pull me in and keep me there until the end? A number of the entries did, but the one that really jumped out at me was Foodycat’s. I loved the details about her mother and the Elizabeth David recipe, and I love that she used a cheese-making mold! Foodycat is my winner for this round. But I also want to name a couple of honorable mentions. I loved the story about the failed marshmallows (sorry!) on Eliot’s Eats. And I can’t get over how many recipes Tina (of Life in the Slow Lane at Squirrel Head Manor) made. Amazing! Made my day. Thanks so much for choosing my book for your club, and for inviting me to play along. And even more, thanks for the kindness. 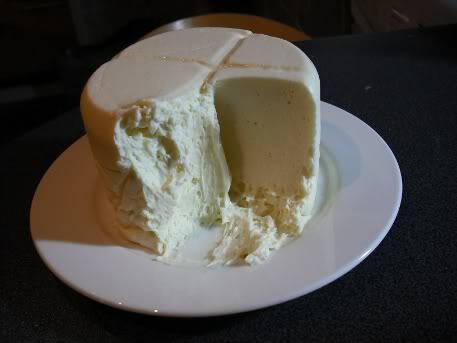 Congratulations to Foodycat and her White Chocolate Coeur à la Crème! Another winners badge to add to her collection! Great job to our honorable mentions Eliot Eats and Tina too!